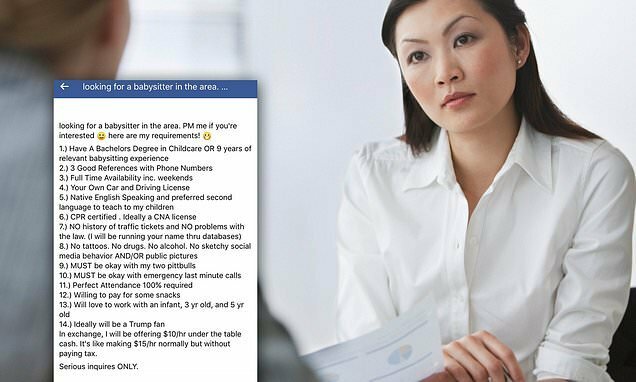 Her location is unclear, however, the mother specified that the babysitter would ideally be a Trump fan, suggesting that she lives in the U.S.
An anonymous mother’s laundry list of requirements for a babysitter has gone viral, after she posted a detailed series of demands for any person who wants to apply for the $10-an-hour role. 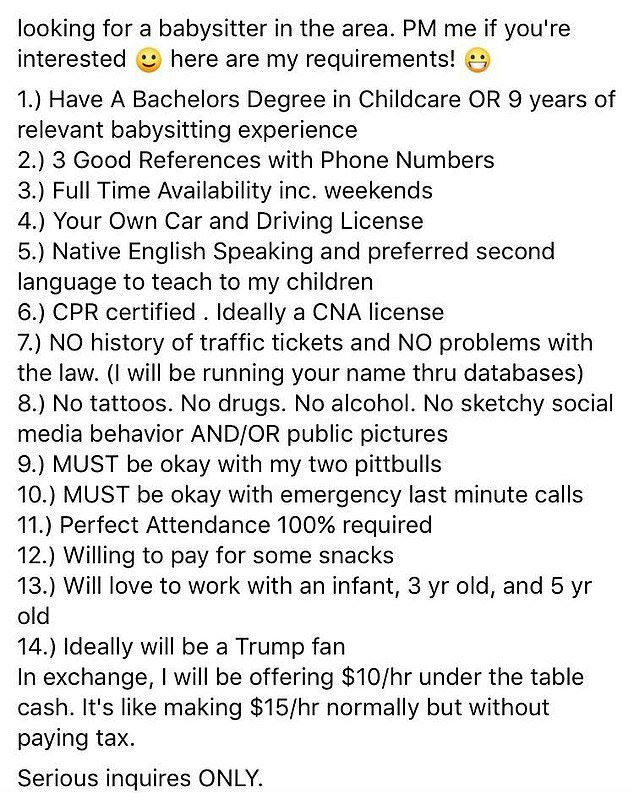 The very lengthy list of requirements includes being a Trump fan, being willing to pay for some snacks for her three children, who range in age an infant to a five-year-old, and having no tattoos. The post, which was originally posted to Facebook by the US- based woman, was later shared on the Subreddit ChoosingBeggars, where it received hundreds of comments from people who were left stunned by the list. She then listed a total of 14 specific requirements that ranged from being an English-speaker, to having no tattoos. And although it isn’t clear where the person lives, the requirement for them to be a Trump fan suggests that the woman lives in the U.S. Some basic requirements included a BA degree in childcare or nine years experience working as a babysitter, three references with phone numbers, and full-time availability including weekends. She also requires that the ideal candidate should have a driving license and a car, as well as being a native English speaker with CPR training. However, the anonymous poster then includes a number of requirements that have left people dumbfounded. The woman wrote: ‘NO history of traffic tickets and no problems with the law’, before adding that she will be running the candidates name through databases. The mother proceeded to add that the ideal candidate for the job must be ‘willing to pay for some snacks’, and will ‘ideally be a Trump fan’. 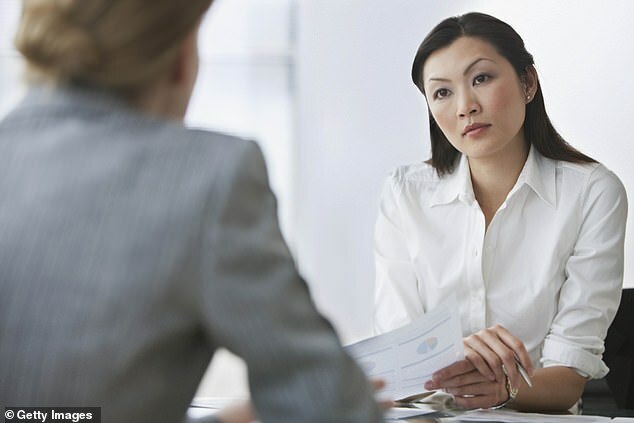 She detailed that the selected candidate for the job will earn $10 per hour in ‘under the table cash’. ‘It’s like making $15/hr normally but without paying tax,’ she added. The post, which was shared on subreddit ChoosingBeggars, received hundreds of comments from people who couldn’t believe her requirements. ‘9 years experience is very specific!! Also, would be worried about someone who had the degree and/or experience but was still willing to graft for $10 an hour’, wrote one Reddit user. Another added: ‘I’ve seen these ads before in NYC but they’ll pay you $60k-80k per year and other perks. Essentially you get paid to raise someone else’s kids. ‘For $10/hr I will come over to watch your TV and eat your snacks. Expect to return to alive children…. that’s it,’ wrote another user. From Katharine and Sophia to Ed and Harry, You Won't Believe These Celebrity Look-alikes! Here We Go… Very First Trailer Drops For ‘Lindsay Lohan’s Beach Club’!